"Finds and removes all types of harmful malware including trojans, worms, bots, adware, spyware, PUPs and more." Defends against Zero-day threats by protecting viruses, spyware, rootkits, bots, Trojans and all other types of malware. Anti-Malware Pro will scan and check for PC vulnerablities within Windows system and apply necessary updates to protect against vulnerabilities to malware and security exploits. Anti-Malware Pro helps you to uninstall software and remove unwanted programs installed on your computer easily! Keep your PC clean! Restore your browser to its initial, clean state. Get rid of dangerous and annoying extensions, toolbars, or hijacked searches. Unlike most anti-virus products, Anti-Malware Pro won't slow your computer down. It's quiet and unobtrusive, just like security should be. 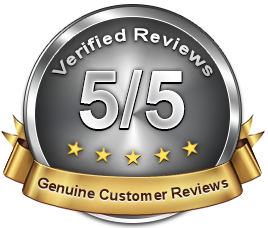 We are here to assist you with a live Microsoft Certified Technician 24 hours 7 days a week including all holidays. We are here to help! "Anti-Malware protection with the lowest impact on PC performance, just like security should be." What is Anti-Malware Pro 2017? 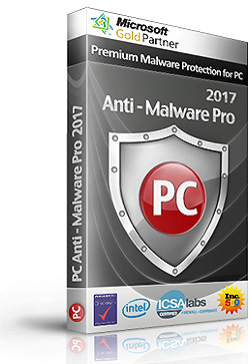 Anti-Malware Pro 2017 is an effective anti-spyware software that will protect your computer from the possible threats; in addition, this Malware Protection tool will clean your PCs system from infections that may have already managed to reach your computer. This malware removal tool has been carefully designed to be useful for different computer users. Therefore, if you want a tool that can guarantee your computer’s safety, you will definitely need to Download Anti-Malware Pro. 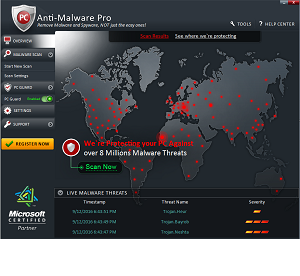 Anti-Malware Pro finds and removes all types of harmful malware including trojans, worms, bots, adware, spyware, PUPs and more. At the core, real-time protection prevents malware, adware and unwanted programs from sneaking onto your PC. The powerful bundle protection prevents unwanted offers from being installed with software you download. 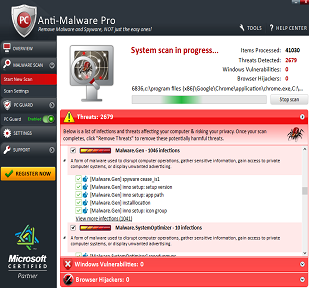 Anti-Malware Pro has many features that reputable malware removal tool should have. For example, Anti-Malware Pro 2017 is known for its advanced scan that is capable of removing even the most dangerous infections, which other antimalware programs may not even find. If you choose to Download Anti-Malware Pro 2017, you will be able to terminate all the malicious system threats with no problems whatsoever. Anti-Malware Pro also offers custom functions for more advanced users; for example, there may be programs that might look suspicious to antispyware scanners, but you know that they are safe. If this is the case, you can choose to keep the application by adding it to the must-be-removed list. This means that Anti-Malware Pro will not try to terminate the program any longer. The users, who choose to Download Anti-Malware Pro, will be also informed about the new dangerous malware every day. Anti-Malware Pro ensures the software’s clients security by learning as much as possible about the newest threats. This malware removal tool is effective because all of the recent infections will be noticed. Anti-Malware Pro 2017 is an effective malware removal tool that will satisfy all computer users from beginners to experienced ones. This antimalware tool is user friendly and you will have no problems in understanding how to manage the software. If you are a beginner with such tools, you will not have to spend a lot of time on Anti-Malware Pro in order to make sure that your computer is protected. Advanced users will find many options that they can choose; for example such users can select which programs needs to be closely monitored or deleted by Anti-Malware Pro 2017. You can also choose when you want Anti-Malware Pro 2017 to execute the scans on your PC. They can be as often as you like; more than that,you will not be interrupted by these scans because you may not be even near your PC when they are performed. Anti-Malware Pro will do all the job for you on the scheduled time that you select. Your computer will be checked from viruses constantly; thus, you will not have to worry about the dangerous infections any more. This is especially important, if you want to ensure that your computer is protected because you may never know when some hijacker will want to infiltrate into your computer’s system. users and enterprises for the last 14 years.